Indiana, just like much of the country, is feeling the fury of record low temps and terrible wind chills. 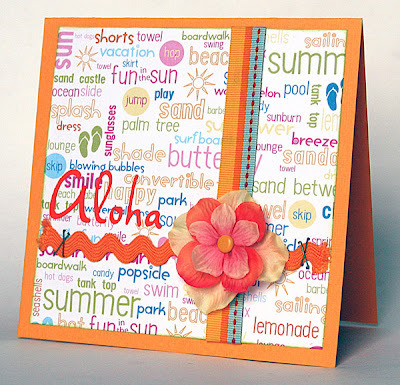 To help keep my sanity I made this summery card for Di Hickman's card sketch release for today. Here's to the power of positive thinking! 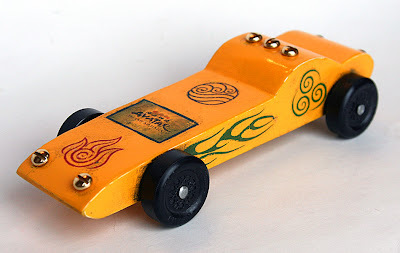 Today was Ian's first Cub Scout Pinewood Derby race. 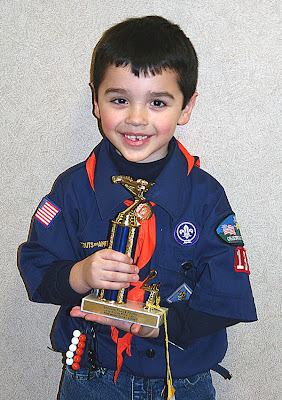 He won second place in his tiger den with his car fashioned after his favorite TV show on Nickelodeon - Avatar. Together with his dad, they named it "The Avacar." It was a great day. Grandma and Pappy joined us for lunch and the Tiger Heats. The boys are already talking about their car for next year. 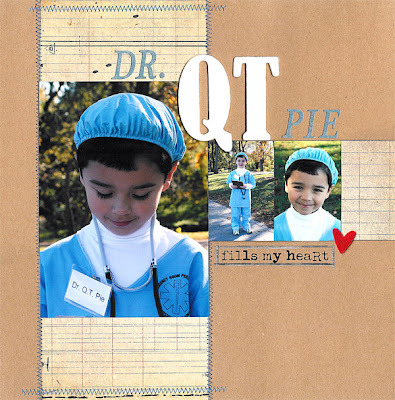 I finally dipped my toe into the waters of hybrid scrapbooking. (Well, actually tonight I *broke* a toe, but that's a story for another post.) I was folding laundry one day this week and really stopped to admire the pattern on a shirt I had recently bought. Even my husband commented that it looked like something I would use in my scrapbooks. So I took a deep breath and started the process. 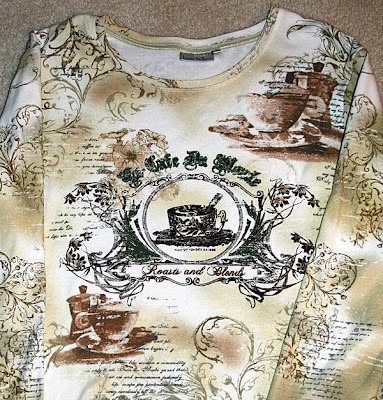 I placed the shirt on my scanner and scanned a portion of the back. After editing a bit in PSE I printed out a section to create a tag. With a little stamping, stitching, painting and coaching from Celeste I created my first hybrid project. I am happy with how the entire layout turned out - could be that cute photo of Mr. Matthew from his birthday a few days ago, huh? 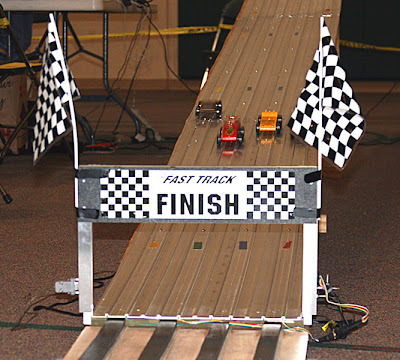 This layout is also my example for the Fiber, It's Good For You challenge I'm running at SBO. Stop by and check out the fun prize you can win! 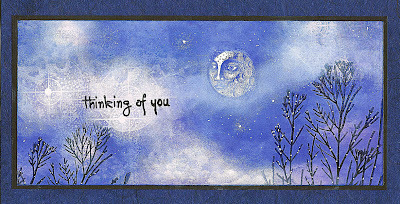 The new Blue Moon challenge is up a Caardvarks - create a card using either the color blue OR a celestial theme. Don't over think this, it can be one or the other. My card used both, but that's for obvious reasons! I used Stampscapes for this challenge. 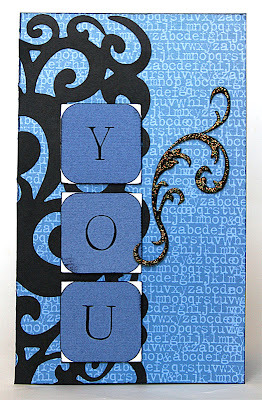 Want to learn how to make this card? I'll be teaching a class called "Heavenly Bodies" on Jan. 29th at Scrapbook Corner in Indiana if you're local. Click on the card for a closer look. 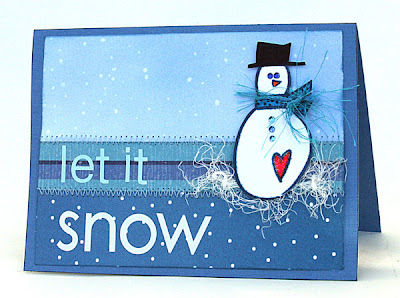 As always at Caardvarks, make your card and link back to the comments section for the challenge post on the blog by January 31st. The prize this month was generously donated by Heart in Hand Scraps. Check out all the details over at 'Varks. Now let's see those cards! 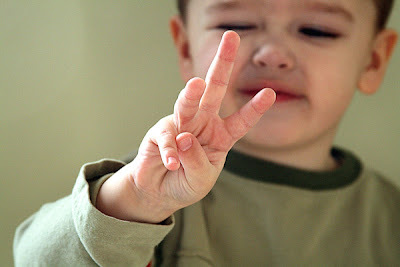 I can hardly believe it, my baby is three. Well actually, Matthew turns three tomorrow, but we're having his party today. Have a special day, sweetheart! I received my copy of Just Cards! Winter 2008 magazine yesterday. I originally submitted this card called "Enchanted Dream" to Scrap & Stamp Arts magazine, but the editor sent it over to use in their sister magazine instead. Click on the page below for a closer look. The fun thing about this castle stamp is that I used it to make wedding invitations for my sister and brother-in-law back in 2003. Gotta love that stamps are so reusable! and all over my scrap desk? Cards!! 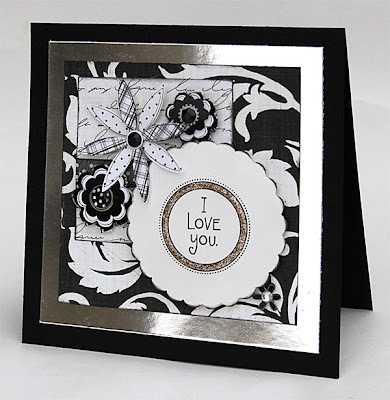 I have gotten into a groove lately with black and white cards, sometimes with a little pop of color. Hobby Lobby's Creative Concepts magazine picked up the last one I posted a few days ago for their spring '08 magazine. 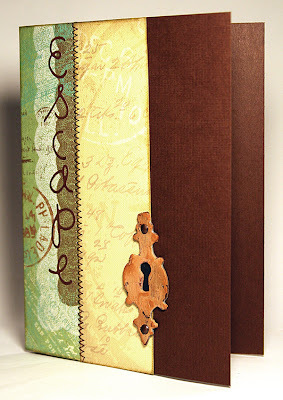 This one features cardstock and mirror paper from WorldWin who is sponsoring the DT at Scrapbooker Online this year. Be sure to stop by SBO during the month of February when we will be showcasing several other exciting products from WorldWin. Well, howdy partner. I made this layout for Basically Scrapbooking and had such a good time playing with grungeboard. Just a few posts ago I confessed my obsession with the new material, and I think it's only getting worse. You can view my tutorial for making this layout here. I am also happy to say that I finally got my Tim Holtz crackle paint to actually crackle. The first few times I used it were frustrating, but for this application it made the perfect crackled finish for my grungeboard hinges. Now I might actually buy more than the one color I already own. 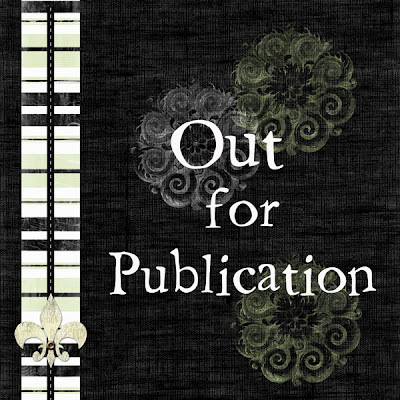 Grungeboard is coming to the Basically Scrapbooking online store (AU) soon, so get your preorder in now. 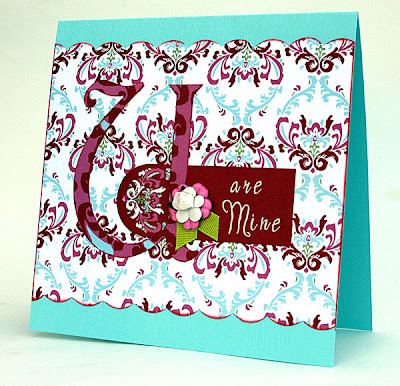 I have the pleasure of working with the new Beloved line from Tinkering Ink this month at Scrapbooker Online. They generously supplied the design team with this new collection of supplies for our monthly projects. I have never used their papers before, so it took me a little while to adjust to their bright colors and bold patterns. I found great comfort using the papers and tags mixed together to make (what else?) the card above. I also had a grand time using this sheet of paper to alter a tray for my friend to use during her Valentine's Day Red & White dinner. I also used crackle medium and some Stickles thrown in for good measure. We have three more weeks of projects with this kit, so be sure to stay tuned for more pop, punch and patterns. Here's my latest card for Di Hickman's blog featuring today's sketch. I made this for my husband who is celebrating his birthday this week. I decided to make this card with the giant YOU on the front so that I can list all of the special things about him inside. Happy birthday, Babe. I'm addicted to grungeboard. 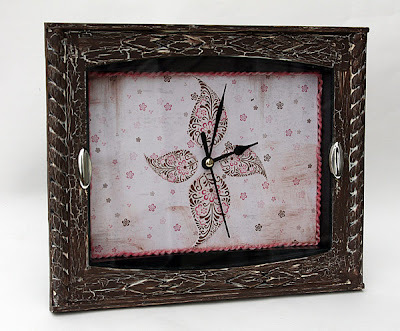 Tim Holtz, you devil, you have done it. 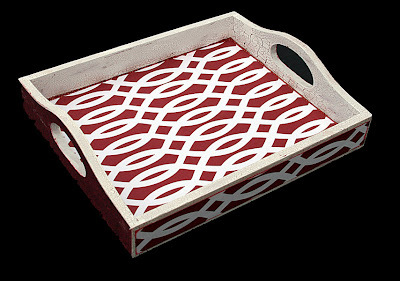 You have created yet another product to make scrapbookers swoon. I have been having a great deal of fun with the elements pack, particularly with crackle finish. 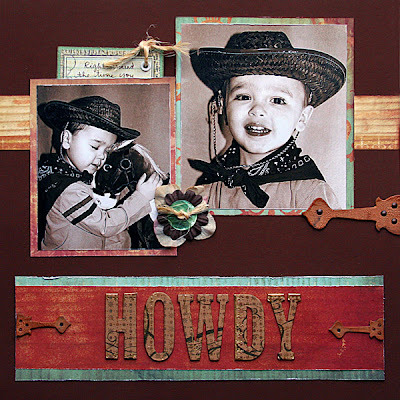 I just made a layout using three hinges like the one pictured above - it was so much fun! I'll be sharing this layout soon. What's been floating your scrappy boat lately? So I have come to the realization that I am a cardmaker at heart. Yes, I started over ten years ago with a few rubber stamps and ended up with about a million Christmas cards. 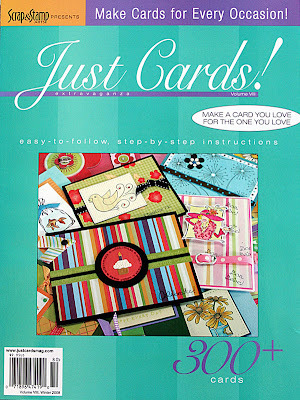 Yes, I participate in several online card blogs and need to create projects for them. But at the end of the day, when I sit down to work the most natural projects that come from my mojo are lumpy, bumpy, fibery (is that a word?) and layered cards. I really love it! I won't give up scrapbooking my family and the special memories we share, and I won't deny that Mod Podge runs through my veins. (Cheryl, did you see that?) Anybody need a card? I am proud to announce my participation in a new altered project challenge blog called (Some) Assembly Required. Each month my friends Jan and Patti will inspire you to create a new piece of altered art to share with the world. Our first challenge is to alter a clock. Link up your creation in the comments section at SAR or email a photo of your project to be included in a drawing for a prize. Let's get going...it's time! Sometimes it just happens - all the right pieces fall into exactly the right places. That's what happened with this layout. I sat down with the January sketch for Di Hickman's blog and literally no idea which photos to scrap. I shuffled things around on my desk with the sketch in mind and had to find photos that were different sizes but of the same topic. When I dug these out of the envelope the mojo started working. This layout is pretty different for me. There's white space for one and no fibers. (Stop laughing, Celeste.) I even managed to sew all over it without having to cover up any accidents. Yes, there are the obvious Basic Grey touches of paper and alphas, but for me that's pretty restrained. I had a really fun time making this layout. I just hope I can get out of my little scrapping box to do it again. Happy 2008! I can hardly believe that we have turned the corner on yet another year. It all seems to go by so quickly! 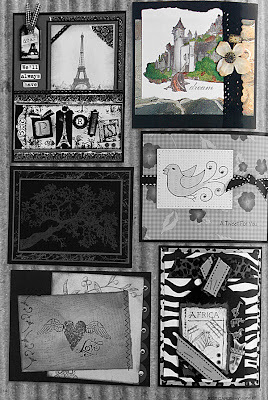 This year is starting out with a bang for me - new Design Teams for both Scrapbooker Online and Caardvarks. It should be a lot of fun!